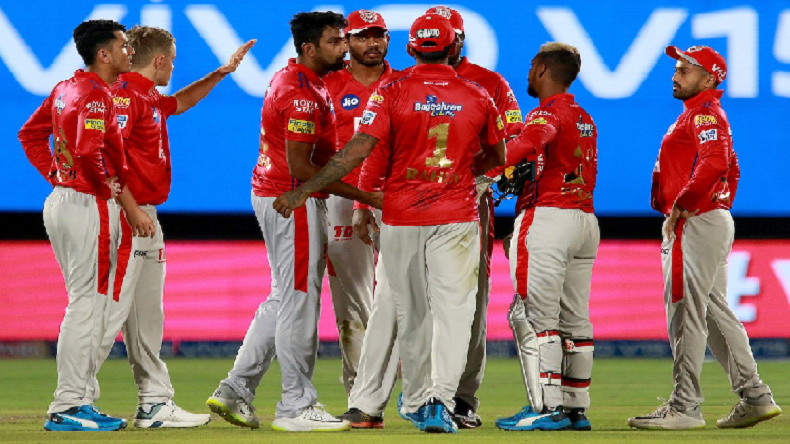 IPL 2019: Chris Gayle's 79 sets up 14-run win for Kings XI Punjab over Rajasthan Royals: IPL 2019: Chris Gayle's 79 sets up 14-run win for Kings XI Punjab over Rajasthan Royals: Dangerous Chris Gayle and brilliant last overs by Ravichandran Ashwin-led Kings XI Punjab to victory over Rajasthan Royals at latter’s home ground on Monday. Caribbean batsman scored 79 in just 47 balls and helped his team to set a target of 184. He was named player of the match for his brilliant performance. IPL 2019: Chris Gayle’s 79 sets up 14-run win for Kings XI Punjab over Rajasthan Royals:Kings XI Punjab beat Rajasthan Royals by 14 runs in the fourth match of the Indian Premier League (IPL) at Sawai Mansingh Stadium, Jaipur. It was the day of Punjab’s Chris Gayle, who was adjudged player of the match for his superb performance. Batting second, Rajasthan needed to chase down 184 in the allotted 20 overs. Skipper Ajinkya Rahane and wicketkeeper-batsman Jos Buttler gave off a decent start to Royals. Both the players made 78 at the first wicket. It was skipper Ashwin, who broke the partnership when he clean bowled Rahane. When the score went to 108 runs for 1, heating argument erupted between Ashwin and non-striker Buttler after former mankaded latter. Buttler was at the non-strikers’ end, when Ashwin came to bowl, he then stopped and took the bails off as Butter was out of the crease. The third umpire was approached for the final decision and without much fuss, he sent Buttler on his way. England batsman Eoin Morgan was quick to react Ashwin’s mankading. He said on Twitter that Ashwin would regret. Shane Warne, former captain and current brand of Rajasthan Royals, was disappointed over Ashwin’s maskading, saying that Punjab skipper had no intention of delivering the ball, so it should have been called a dead ball. The third wicket was dismissed by Sam Curran when he castled Steven Smith. He was returning after serving a one-year ban over ball-tampering scandal. He scored 19 in 16 balls. Buttler made 69 in 43 balls. Curran dismissed Sanju Samson Smith in the same over. In the last three overs, the team needed 35 in 18 balls with six wickets in hand. Ben stokes and Rahul Tripathi were on crease. Tripathi gave strike to all-rounder Stokes, who hit six in the first delivery he faced off Mujeeb Ur Rehman. But on the second delivery he gave himself of room and tried to play towards long-on, only to get caught by substitute Nair. On his last delivery Rahman dismissed Tripathi. The last seven wickets of Rajasthan fell on just 16 runs. Rahane-led team could make 164 in response and lost nine wickets. For Punjab, Curran, Rahman and Ankit Rajpoot picked two each wicket while skipper Ashwin claimed one. Two Rajasthan players were run-out. Earlier, after invited to bat first, Kings XI Punjab did not get a steady start like rival team. Opener Lokesh Rahul was departed early in the first over by Dhawal Kulkarni on a paltry four runs. One-down batsman Mayank Agarwal joined dangerous Gayle. Agarwal was castled by Krishnappa Gowtham in the ninth over. He scored 22 in 24 balls. After Agarwal’s dismissal, the charge was taken by young Sarfaraz and experienced Gayle. Both engineered a 84 run partnership in 42 balls. It was Stokes who struck and departed Gayle in the 16th over, but not before the damage left-handed batsman did. Gayle made 79 in 47 balls with four sixes and eight fours. The fourth wicket fell of wicketkeeper-batsman Nicholas Pooran when the score was 167 in the first delivery of last over. He was dismissed by Stokes. In the last five balls, he was expensive and conceded 17 runs. Sarfaraz scored unbeaten 46 in 29 balls with a six and six fours. Agarwal also contributed 22 runs. For Rajasthan, Stokes picked two wickets, Kulkarni and Gowtham picked one each.